God wants to work on you first, because transformation won’t happen in your life until you renew your mind, until your thoughts begin to change. Be careful how you think; your life is shaped by your thoughts” (Proverbs 4:23 GNT). You want God to take away all of the problems, pain, sorrow, suffering, sickness, and sadness. But God wants to work on you first, because transformation won’t happen in your life until you renew your mind, until your thoughts begin to change. Manage your mind, because your thoughts control your life. 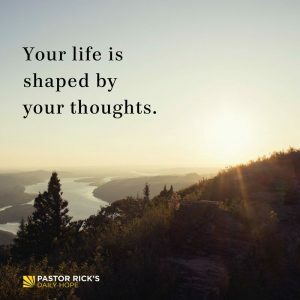 Proverbs 4:23 says, “Be careful how you think; your life is shaped by your thoughts” (GNT). Your thoughts have tremendous ability to shape your life for good or for bad. For example, maybe you accept the thought someone told you when you were growing up, “You’re worthless. You don’t matter.” If you accepted that thought, even though it was wrong, it shaped your life. 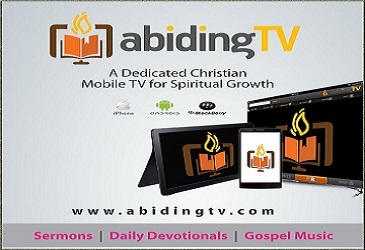 Manage your mind, because the mind is the battleground for sin. One of the reasons why you get mentally fatigued is because there’s a battle in your brain 24 hours a day. It’s debilitating because it’s intense, and it’s intense because your mind is your greatest asset. Satan wants your greatest asset! Manage your mind, because it’s the key to peace and happiness. An unmanaged mind leads to tension. A managed mind leads to tranquility. An unmanaged mind leads to conflict. A managed mind leads to confidence. An unmanaged mind leads to stress. When you don’t try to control your mind and the way you direct your thoughts, you will have an enormous amount of stress in your life. But a managed mind leads to strength and security and serenity. What do you fill your mind with that pleases God? What do you fill your mind with that disappoints God? How do you practice managing your mind? What role does Scripture play in managing your mind?